This aircraft paper model template also submitted by ZION, he actually send to me 3 templates, this one is an Airbus A330 Turkish Airlines Freighter aircraft. ZION is a middle school student from South Korea. Display stand seen in the photos below is not included in the template. The original A330 template is on letter format, I've change it into A4 format, but you still be able to print it in letter. How to print : You have to set the paper size with A4 in printer properties but you use letter sized paper on the paper tray. This model was submitted by Kim Hyeon Gon (ZION), he is a South Korean junior/middle high school student. 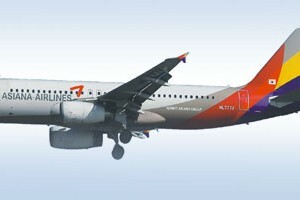 He recolor the original Paper Replika's Airbus A320 template with Asiana Airlines livery. When this model received by me he already in progress on building this aircraft model as you can see on a photo below, it looks very nice and the livery color is beautiful, I like it. The template sent by ZION is actually relatively big in size, it's 28 Mb! He created it in Adobe Photoshop, so I edit the template again in Corel Draw and re-use the existing vector images.to reduce the file size. My effort resulted with a final 1,18 Mb size template in PDF. Asiana Airlines is the second major airlines beside Korean Air, it has domestic and international flight as well. It has 11 A320 planes in the fleet. This release adds up one more to the A380 airliner users collection in Paper Replika airliner category. Emirates now operates 21 of these type of airplane from 69 orders to Airbus and Emirates said to aim for 120 planes. 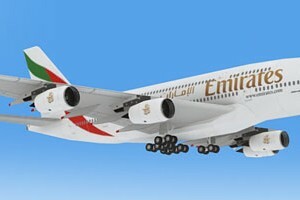 It makes Emirates the largest operator of this biggest passenger airplane in the world. First Emirates A380 was received in November 2005 in Dubai. This paper model kit is a recolor of previous A380 series. This A380 paper model template is a quick re-color from A380 series from Airliner category. While still making a War Machine 3d model (Iron Man 2) , I made this re-color in 2 hours. Korean Air first A380 was delivered on May 2011, it currently serve Incheon hub to Tokyo, Hongkong, New York and Los Angeles. 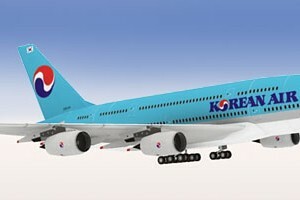 Korean Air is one of seven airlines that are using Airbus A380. Paper Replika is already has 4 airliners , 3 more to go. 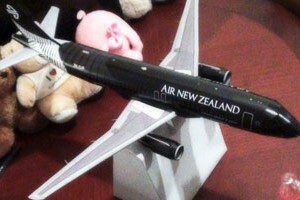 Air New Zealand were commissioned me for a paper model template design of one of their Airbus A320 fleet livery. We also have an agreement that I can share with you all although it is a commissioned project. It took a week for me to complete the templates and 3 days more to build and to photo the build model. There is a difference between model that release in Air New Zealand's "theflyingsocialnetwork.com" and Paper Replika, Paper Replika's version is without a calendar on its stand.